These Italian Almond Macaroons are an old family recipe passed on from my Italian grandmother that she made for many years. This would be a great cookie for any holiday, but we have them every year at Christmas as they are a legacy in our family. This Grandma’s Italian Almond Macaroons recipe is an old family recipe passed on from Mr. Wishes Italian grandmother that her and her Italian friend, Ruth, made for years and years. I meant to share it at Christmas time and things got too busy and it slipped my mind! This would be a great cookie for any holiday, but we have them every year at Christmas. I hope I did this almond macaroon recipe justice because it is a legacy in the family. Because I was clueless, I had to do a little research on macaroons since I always see it being spelled two different ways and people seem to have different ideas of what macaroons are/should look like. The word “macaron” is actually not an alternate spelling of macaroon. In fact, the two terms refer to distinctly different things. Both macarons and macaroons are confections, and both names are derived from ammaccare, which is Italian for “to crush” — but that is basically where the similarities end. Who knew?! THIS type of macaroon treat that I’m sharing with you today has a crunchy exterior and a very soft interior that’s almost nougat-like in that it’s very chewy. To add to the confusion, it’s occasionally called a French macaroon. The almond or coconut macaroon, or congolais, as it’s called in France, is frequently served during Passover because it contains no flour. I thought that was pretty interesting! 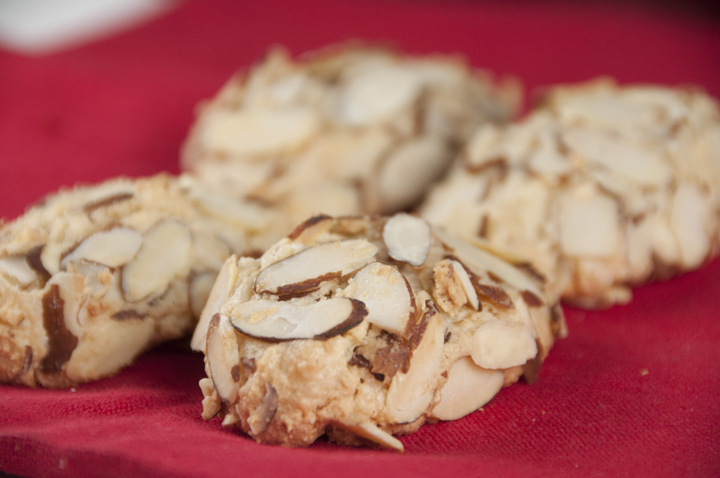 These Italian Almond Macaroons are an old family recipe passed on from my Italian grandmother. These cookies are a legacy in our family at Christmas time. Whip egg whites in the bowl of a mixer for 5 minutes or until stiff peaks form. Add sugar to bowl and whip together with the eggs. Stir in almond paste (after you break it up/cut it into chunks to make it easier to blend). Roll into ball and chill overnight or for several hours. Take a tablespoon of dough and roll into 1.5 inch roll (oblong shape). Roll in sliced almonds.You may have to press the almonds a little bit into the cookie so the dough is covered with almonds on all sides. Bake at 300 degrees for 30-35 minutes, one sheet on bottom rack one on middle rack (if using 2 sheets), switch positions halfway through. You want to bake them long enough so the almonds are getting a little toasted and crunchy but not too dark. You don't want these cookies to be super light in color because they won't have the right crunchiness and the almond flavor won't be as strong. Mine took 35 minutes in my oven and I did them all on one large cookie sheet in the center of the oven. Enjoy! Why bake at 300 degrees for 35 minutes? I sort of followed this recipe but baked at 350 i think… much shorter baking time, crispy crunchy, and not pale. They were delicious. I also cut sugar by 1/3. And i did let the dough sit in the fridge for a bit…maybe 1/2 hour. They were delicious! *Running to the kitchen now*! Yay! I’ve seen these beauties on cookie tables with my Italian family before!! Yes – it’s hard to go to a party with Italians and NOT see these cookies!! These are one of my very favorite cookies! Anything with almond paste gets me excited and I always have a can in the house for an almond macaroon “fix”. Yours looks delicious with the sliced almonds on top. Old family recipes are just the best! How many cookies does this recipe make approximately? What quantitiy of sliced almonds is needed? Cindy – sorry about that! 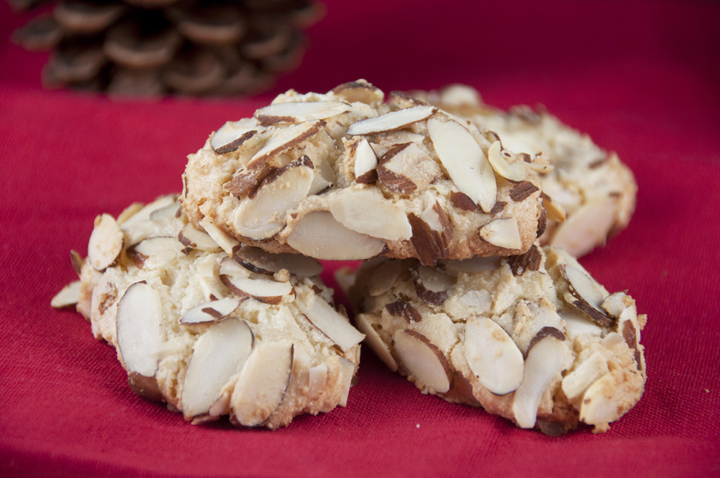 It made about a dozen cookies for me and I used a little over a cup of the sliced almonds. I put them in a bowl and just added a little more as I needed them. I always wondered what the difference was but never bothered to look it up before! Thanks for the lesson ;–) These look fab! I love anything with almond paste. It always smells so amazing. These cookies look delightful! P.S. where can I buy almond paste? I found it at my local grocery store! Hi! 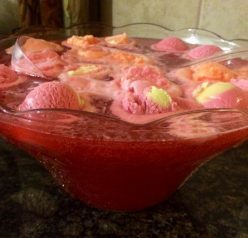 This looks really delicious.. I dont think I could find almond paste here although the Spanish do love using almonds in their desserts.. maybe I could, I just haven´t looked..
You could always look online and see if you can get it on amazon or something! Hmmm I think I just found a good use for all of those sliced almonds I just received! All those crunchy sliced almonds are calling my name! Can’t wait to try these cookies. Easy to make too. Yes – so easy!! Thanks, Laura! Thanks for this recipe! My grandma used to make these cookies which we always called “almond paste cookies”. Hers used to have a yummy cherry on top. I never got the recipe before she died. I forgot how much I loved Grandma P.’s cookies, too. You don’t have her gnocchi recipe, too, do you? I remember going over there with your hubby, SIL, etc. when we were little but I’ve never had gnocchi like Grandma P. made since. I hope you try it!! Thanks! Thank you for the macaroni / macaroon lesson. 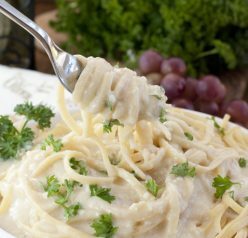 Nothing like a recipe from grandma, simple yet full of flavor! Oh, Ashley! Why didn’t these get served when I was there???!!! They look so yummy, I can’t stand it! Is “marzipan” another name for almond paste? Oh, the way the texture of these cookies looks is making my mouth water. I made my own almond paste, the second time that I made these. The first, which was 2 days ago, were amazing!!!! So, my question is, how thick should the batter be? It’s hard to roll being it’s so sticky. Do I need to chill it longer maybe? Thanks for the recipe by the way! So yummy! And cheaper than paying what they charge at the Italian bakery, for just 6. Can you freeze these cookies? If not how long will they last once baked? Yes I freeze them all the time. They only last a few days otherwise. Thank you, Ashley, looking forward to trying these. One more quick question. If not frozen, how long will these cookies keep in airtight container at room temperature? I need to bake cookies on Tuesday to donate to church on Saturday. These cookies will be packaged with others and delivered to the elderly and/or others that might have serious illnesses in their families and won’t have time for holiday baking. 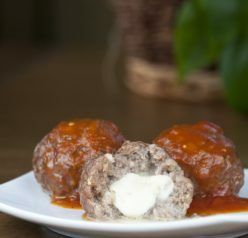 While these look so yummy and I am anxious to make them. I am wondering if they will be still ok if the recipients don’t eat them right away. I would say they’d be fine for 4-5 days as long as they are in an airtight container. Thanks!! I am trying these because of the picture!! I get some from a bakery by me but they are $1.50 a piece! I will try this recipe today.